19th April 2018, New Delhi: India is a country in constant election mode. Between Lok Sabha, State Assembly and Civic Polls, there is an election somewhere almost every quarter. 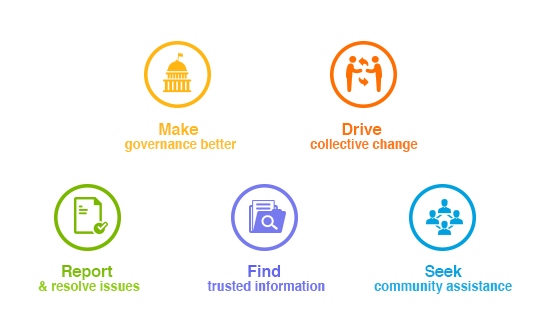 The big question is, if we are always in politics mode, when do we spend time on governance. At the same time, some of these elections serve as a check and balance and allow for non-performing parties or candidates to be voted out of some responsibilities faster than their constituencies waiting 4 or 5 years. 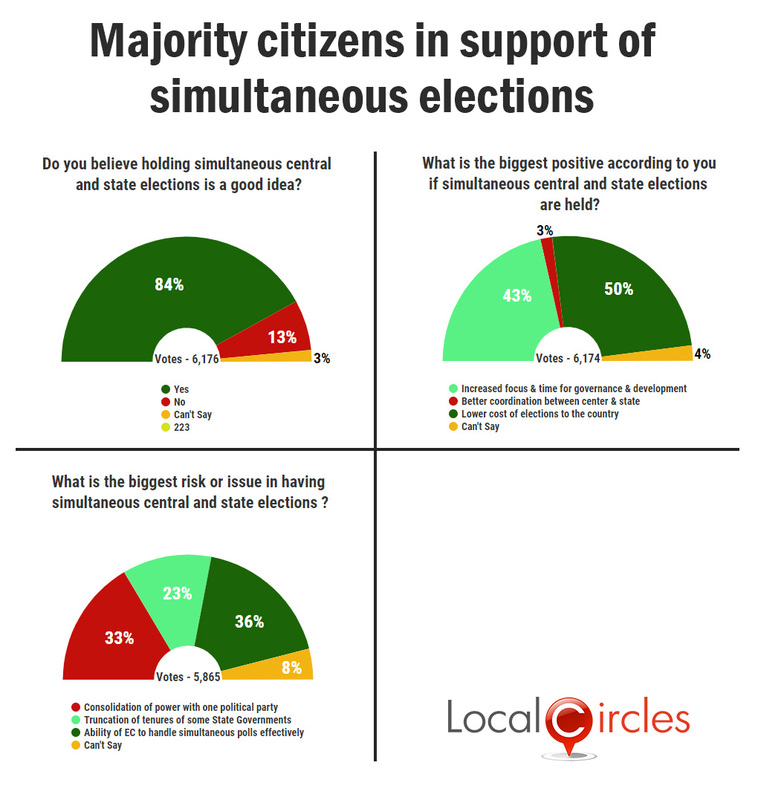 To understand the topic of simultaneous elections better, LocalCircles carried out a set of polls which received more than 18,000 votes. 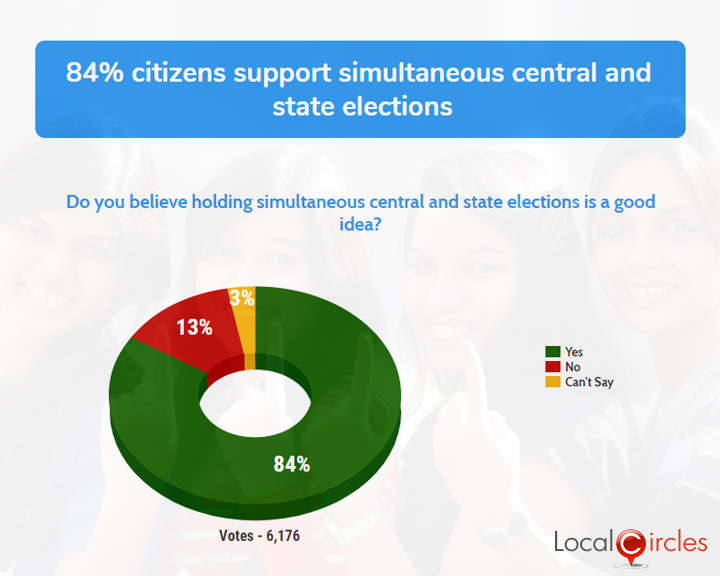 In the first poll 84% of the citizens voted in favor of having the state and central government elections simultaneously. This means that an overwhelming percentage of citizens want that the elections for the Lok Sabha and Legislative assemblies should be held together from 2019 onwards. Only 13% voted against it and 3% said they were not sure about it. The second poll asked citizens what were the biggest positives according to them, if simultaneos elections were to happen. In response, 43% said it would increase focus & time for gevernance and development, 3% said it would lead to better coordination between center and state, 50% said it would lower the cost of elections to the country and only 4% said they were not sure how it would help. 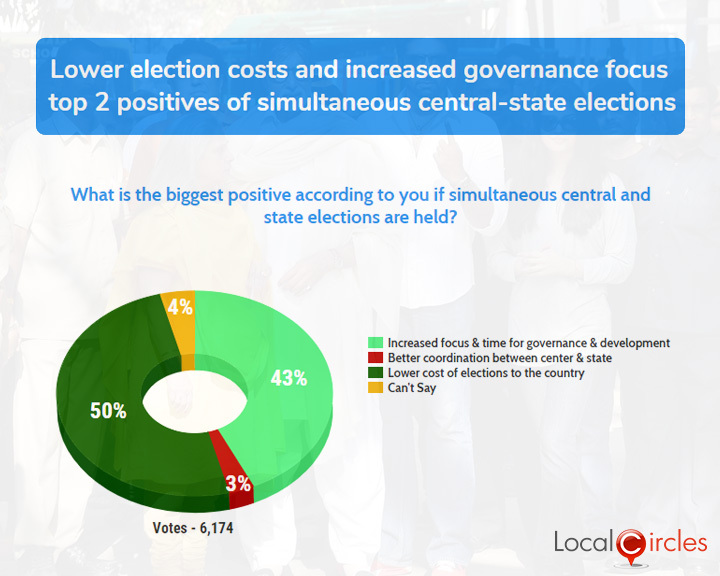 The last question asked what is the biggest risk in having simultaneous state and central elections. 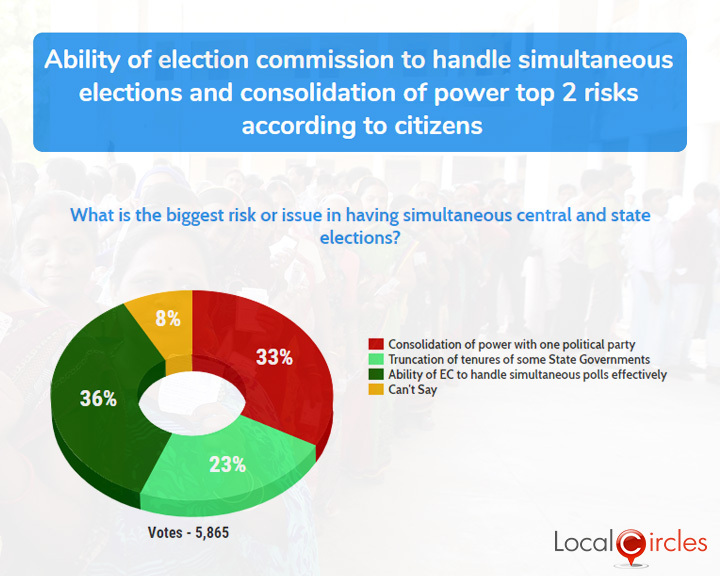 33% respondents said it could lead to consolidation of power with one political party whereas 23% said it could lead to truncation of tenures of some state governments. 36% said the Election Commission might not be able to handle simultaneous elections well and 8% chose not to answer the question. Citizens have acknowledged that smaller and regional political parties may be opposed to simultaneous elections as some fear they might lose their control over the state. Citizens also feel that with simultaneous elections, money spent on conducting elections will be saved, there will be less disruption, and it will force the central parties also to focus on local development issues. Citizens also pointed out the flip side that for a period of 3 months the whole country will be in election mode and Government work may come to a standstill. Moreover to some citizens, the number of booths and complexity of such an election will be massive and Election Commission may not be able to manage it.